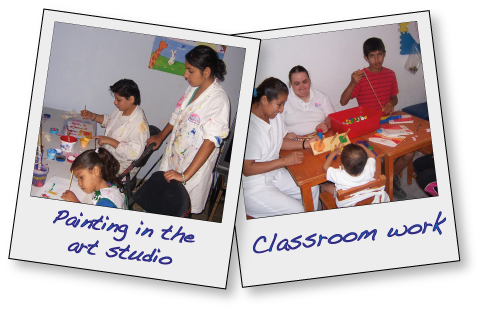 The primary mission of Pasitos de Luz (PDL) is to support low income families with free daycare for their disabled children. These children’s disorders include Cerebral Palsy, Down Syndrome, Muscular Dystrophy, consequences of Meningitis and Microcephaly, to name just a few. 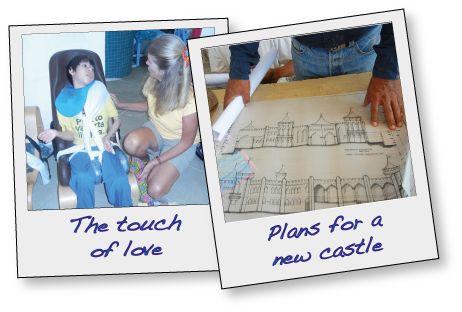 Their goal is to provide each child with the fullest life possible and one that is full of dignity and value. Being the parent of a disabled child, and needing to work to provide a home for their family is a challenge regardless of what country one lives in. And when a child is disabled, ones options become even more limited. Most day care facilities are not equipped to provide a safe environment, let along skilled staff members who have the patience and abilities (or training) to deal with the day in, day out work involved with a special needs child. In 1999, when Yolanda Sanchez decided to dedicate her life toward children with disabilities and helping their families, she founded Pasitos de Luz (little steps of light), a day-care facility, in a small house owned by her family. For eighteen years she, her staff, and volunteers have been providing free services of nutrition, physical rehabilitation, special education, and much more to these special children. Over 120 families benefit regularly from these services; however there was a waitlist of many more needing therapy and treatment. In 2011, Yolanda had a dream of a new, much larger facility, and as fate and karma would have it, Peter and Teena Oudman shared this same dream. They became involved in finding donors and volunteers so that construction for Casa Connor could begin. Teena and Peter have devoted their efforts over the past five years to building a new 22,000 square foot facility for Pasitos de Luz, and on January 9, 2017 the new facility was officially opened. The children meet at the Pitillal location and as soon as they hear the word “bus” they can’t wait to get out to their new building!! The center has a gymnasium, physical therapy room, hot tub therapy area, classrooms, rooms for naps (and eventually respite), media room, laundry room, kitchen, dining room (children eat breakfast and lunch there), outdoor play area, offices and more. The CSHF is honored to be a small part of this loving, compassionate facility and are committed to helping them share their tremendous load through our consistent financial support. Our goal is to assure these children and their families that the ‘light’ will continue to glow and their future will thus become brighter. But this is only possible with the support of donors like you.